"This has been my favorite jam since I was a little girl. We moved around a lot when I was young; my Grandmother would send this jam to us so that we still felt we were close to 'Grandma's house.' I love it on warm homemade bread or peanut butter and jam sandwiches. Enjoy!" Mix pears, fruit pectin, cinnamon, cloves, allspice, nutmeg, and lemon juice in a large heavy pot; bring to a boil, stirring constantly. Add sugar all at once, stirring, and bring back to a full rolling boil. Boil for 1 minute. Mix in butter to settle foam. Sterilize the jars and lids in boiling water for at least 5 minutes. 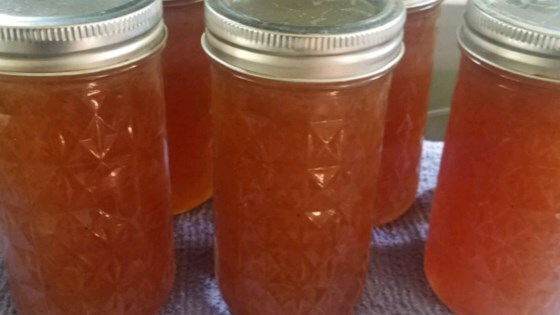 Pack the pear jam into the hot, sterilized jars, filling the jars to within 1/4 inch of the top. Run a knife or a thin spatula around the insides of the jars after they have been filled to remove any air bubbles. Wipe the rims of the jars with a moist paper towel to remove any food residue. Top with lids, and screw on rings. See how to turn pears into a sweet condiment that tastes just like honey. This recipe turned out great! I used low sugar pectin and only added 2 cups of sugar and it is still plenty sweet. good but all I could taste was lemon juice. hopefully when it cools and sets, it won't be as strong. I only changed the amount of sugar to 4 cups per other's suggestions. It turned out wonderful! I used starkrimson pears which is why my pears are more red compared to other photos.